Hold me close, never let me go-oh oh. Keep this feeling alive. Make me lose control. It was a song in the 1980's from a guy from Cleveland who had a huge hit in "Hungry Eyes" from the movie Dirty Dancing. It went to #3 on Billboard's top 100 songs. When I'm on the road, in the Chicagoland area, you know I listen to jazz, WDCB. If I go west, to Iowa, I have to wait until I'm about 30 minutes into the state before I can pick up the Kirkwood College jazz station, KCCK. In the meantime, I'm in a vast area of search button pushing to find something I'll listen to. I've been in the car a lot in the past month. The most recent trip was to Iowa. All of this has been for business. If I'd get my act together, I could bring my CD folder and know that I'd have my preferred music wherever I go. But the last time I cleaned out the CD folder was back in November and there's Christmas music in it. I only think about cleaning it out when I'm pulling out of the drive or, like right now, but if I stop blogging and clean out the CD folder, I'm liable to forget about blogging. It's that whole idea we, in the gaming world, call the "ooh shiny" effect. Anyway, having had to go to Wisconsin every day for a week and then to Iowa, I've spent a lot of time button punching to find something I'll listen to. I find myself gravitating toward "oldies" stations and the "oldies" I listen to are from the 1960's through the 1980's. While I listened to jazz during those years, I also was quite aware of what was going on in pop music. On a previous work trip last year, I decided to write down the names of the songs I heard more than once because I knew I'd be going into and out of various radio station broadcast areas. It was going to be interesting. There's a huge amount of music in those 20 years. Why, if I'm going from place to place, do I hear the same songs played over and over? I haven't heard the above song in a very, very long time in spite of its standing as hugely popular in 1988. There is a web site I follow, Upworthy. Politically left, they find some interesting videos that cover a large gamut of social causes. Sometimes, I think they are too far to the left for my tastes, but they have shown me interesting points of view. One of their posts from last month hit close to home. You don't have to agree with Upworthy's stance on raising the minimum wage, banning fracking or gun control, but this is something you should be concerned about. It's not just how often you hear "Mrs. Robinson", it's how often you hear Taylor Swift, Lady Gaga or Mozart. It's how many sports or talk stations you can find. 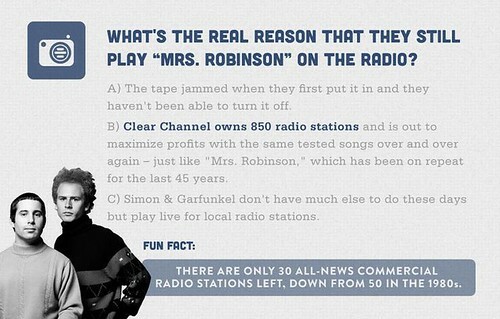 It seems like a long time ago, but radio stations were fairly independent entities. Their play lists were dictated by what music the station itself could get its hands on. Now, the feed is created somewhere else and sent to the station. 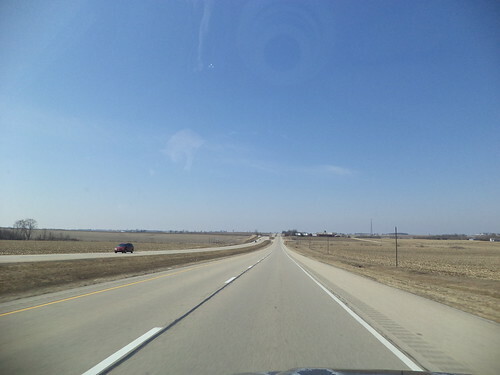 It's mixed up just enough that if you're driving from Chicago to Cedar Rapids, you'll hear similar songs on the oldies stations, but maybe not the same ones. WDCB moved, at the beginning of this year, to larger quarters driven, in part, by their vast collection of jazz. They have music they bought and their DJ's decide what they are going to play, not some corporation somewhere outside of the station. (The Saturday morning DJ routinely brings records to his show, stuff you can't find in CD format.) If I call in and ask for Ella and Louis' "April in Paris", they have that. One of my friends in Ohio posted a complaint on Facebook against a local station. They were doing a "you request it" event and the song he requested hadn't been played in 12 hours, in spite of numbers the station posted on its web site suggesting he wasn't the only person who wanted to hear that song. It's admittedly hard for a station to have all music from their selected era. If you include things like "one hit wonders", the artists that had one hit, even a minor one, and then dropped out of sight, the songs must be in the millions. I like Billy Joel. I should get a greatest hits album. But I heard "Still Rock and Roll to Me" three times in the Iowa trip. Think about Joel's body of work and this is the song I heard. It's not an answer to pay for Sirius XM radio. I don't see that as any more broad than having 6 corporate entities decide what I will listen to. The problem is that new artists have a much, much harder time getting any air for their music. This is across the board from country to pop to rap to classical to folk. (When was the last time you heard a folk song on the radio? Be honest. Yeah, I didn't think so. WDCB plays 3 hours of folk music on Tuesday night at 8 p.m. This is more than Peter, Paul and Mary or the Irish Rovers, too.) We are exposed, less and less, to interesting new voices and more and more to prepackaged, over hyped artists with similar sounds. I hope that the next time you're listening to the radio and "Mrs. Robinson" comes on, you'll remember that Simon and Garfunkle have a great many more hits than this; "The Boxer", "Sounds of Silence" and "Bridge over Troubled Waters", are three of their biggest hits, bigger than a song from the movie, The Graduate. Chances are good, you won't hear these in your travels because someone somewhere far away from where you live decided that "Mrs. Robinson" is the song you get. That should bother you.